Why she's lovin' him: Back in the mid-2000s, around the time I was in high school, I was obsessed with musical theatre. There was a time in which I knew every musical nominated for a Tony Award that year (shout-out to the days of Jekyll and Hyde, You're a Good Man Charlie Brown, Wicked, and Spring Awakening). I was in theatre in high school (repping the ensemble), and loved the rush of performing — even the nerves that came with them. Last year, I rediscovered that love of Broadway again, thanks to Hamilton and Waitress. Admittedly, this year I fell out of touch again with the musicals making the critical rounds. Friends of mine had posted about Dear Evan Hansen on social media, but I basically scrolled right on past their posts, not even taking the time to Google what the musical was about. (All I knew was that it had some dude with a cast on his arm.) I watched the Tony Awards again this year, and perked up when I heard that Dear Evan Hansen would be performing a song (okay, mostly I was perked up because Rachel Bloom was backstage at the awards, talking about them). I loved Ben Platt in Pitch Perfect and its sequel, so I figured it would be a good performance. I was wrong. It was a great performance. Platt plays the title character in the musical, and delivered a powerhouse rendition of one of the show's biggest numbers, "Waving Through a Window." What struck me the most about Platt was how in tune with his character he was. On an initial watch, it's just a wonderful, well-done vocal performance. But when I read about the plot of Dear Evan Hansen and the title character himself (a socially awkward and anxious teenager), then re-watched the Tony's performance, I was blown away. Ben Platt doesn't just get his character — he's inhabited him. In his performance there are facial and physical tics (nervous fidgets, glances, etc.) that perfectly convey the anxiety that Evan faces on a daily basis. Moreover, I was scrolling through the YouTube comments on the Tony's performance video and noticed that someone posted an article where it's explained why Platt lifts his leg while performing. He's gotten so into character and Evan's posture that he needs to lift his leg to relieve some of the pressure on his nerves. Platt might have been a supporting player in Pitch Perfect (he's charming as all get out in that franchise), but he's the star of this Broadway musical. He throws everything he has into Evan Hansen, and it's clear through the emotional vocals on the soundtrack and in this Tony's performance. Do yourself a favor and watch if you haven't, then go listen to the gut-wrenching Dear Evan Hansen. You'll be as blown away as I am by Ben Platt. Trust me. Why she's lovin' it: For those of you who get as nuts as I do about Oscar movies, I am disappointed that it has taken me this long to finally sit down and watching Loving, easily one of the best movies from this year's race. 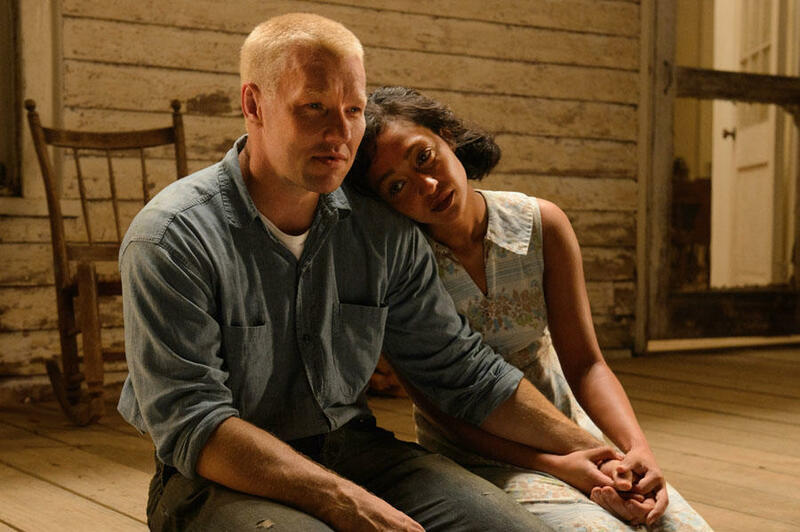 It tells the story of two people, played beautifully by Ruth Negga and Joel Edgerton, who fell in love and got married in 1960s Virginia. But the problem was that theirs was an interracial marriage and that was illegal at the time. They were arrested and told to leave the state of Virginia for 25 years or face real jail time. So they headed to D.C. but soon realized their home was still in Virginia. Cut to years (and three children) later and it's 1967 and they're taking their case to the Supreme Court. The case eventually became Loving v. Virginia, and it was historic in its abolishment of declaring interracial marriage to be illegal. Not only is the story unbelievably beautiful and the acting just beyond superb, the fact that this was a true story made it just that much more important. In today's society, we're free to date whomever we choose and it's (generally) not frowned upon. To see these two people fight so hard for their life together — to have their families originally okay with everything to them seeing the whole affair as nothing but troublesome — it was just amazing. Their love story is why we're allowed to date, marry and have children with anyone from a different race as ours and not face legal troubles for it. I thought it was just a fantastic movie and I was good until the epilogue. I sat and bawled my eyes out when they said what went on after the events of the film took place. It was just something so intense that you couldn't help but cry. I think if any epilogue can do that on a based-on-a-true-story, they did the story proper justice. If you haven't seen this film, I suggest you immediately high-tail it out of the house and find it at your local Redbox, rental store (they seriously still have those, promise), your local library like I did or just find it on a streaming service (I think it's on Amazon). It's just such an important film to watch and I could not possibly recommend it more. Why she’s lovin’ it: If you’re like me, you’ve likely watched every season of The Great British Bakeoff that Netflix has about five times. The Great British Bakeoff (or The Great British Baking Show, as it’s called in the U.S) is probably the perfect reality/cooking show. The premise is this: a bunch of bakers go into a tent and bake three things each week. At the end, one is named star baker and one is eliminated. Every week the bakes get harder and weirder, and usually they’re asked to bake something none of the bakers has ever heard of (kouign-amann, anyone?). I’m not usually a fan of competition shows because they are usually pretty stressful and everyone is so mean to each other, but everyone on Bakeoff is so lovely and kind! Sometimes one contestant will finish a challenge early and go off to help someone else get their cake out of the pan or make garnishes, which is deeply heartwarming to me. Likely this marked non-competitiveness is because at the end of the show, the winner walks away not with a cash prize, but with a commemorative teapot (and the pride of a nation). The show is made even better by the hosts, Mel and Sue, who are always ready to lend a helping hand, throw out a few good puns, or taste test the bakes. Also, of course there’s the silver-haired, highly critical, Paul Hollywood and legendary perfect grandmother Mary Berry. She is so kind and supportive even when people’s bakes don’t go as well as the bakers wanted, and she’s the warmest and kindest and most stylish baking savant I can imagine. I did some research on Mary Berry and found out she had polio as a teenager and lost most of the movement in one of her hands, and she can still roll out pastry better than I’ll ever be able to. What a paragon. Paul Hollywood, a professional baker from a family of professional bakers, is super critical but also always willing to show someone how to improve their kneading technique (just don’t give him soggy-bottomed pastry). Tragically, the new season of Great British Bakeoff will be on a different network and will not feature Mel, Sue, or Mary. So if you’re in need of some extra content to see you through these dark days, I recommend The Great British Baking Show: Masterclass, which Netflix just added recently. On it, Paul and Mary go through all the recipes they featured on the show and teach us how to make them. Paul and Mary have delightful rapport and look like they have tons of fun together. Plus, you’ll get to learn how to make a Berry and Hollywood approved cake/pie/complex pastry sculpture. What more could you want? Why she’s lovin’ it: So, I’m terrible at finishing book series. I love starting them. But finishing them? Not so much. Maybe it’s a subconscious fear/sadness of things coming to an end and not wanting to say goodbye to characters I’ve grown to know and love over the course of a lengthy saga. Who knows. One thing’s for sure though: saying goodbye to Rick Riordan’s characters is TOUGH. No one writes snarky, heroic teenage demigods better than Riordan. My dad is a huge fan of mythology — especially Greek lore — and instilled that same love in me. When I was little, he’d read me the myths like they were fairytales, and when I was older we watched the epically corny (but oh-so-great!) Hercules: The Legendary Journeys and Xena: Warrior Princess together. I discovered Riordan’s Percy Jackson series shortly after it came out in 2005 and it did not disappoint. I didn’t want it to end. And then Heroes of Olympus came along and it was a continuation of the characters and stories introduced in Percy Jackson, but with some stellar Roman demigods thrown into the mix, all battling it out (sometimes with each other, mostly with those pesky gods) to save the world. What could be better? But somewhere along the way, I got sad about it ending. And let’s be honest, real life has a tendency of getting in the way of finishing lengthy tomes chock-full of adventure. So, about three years after the fifth and final book in Heroes of Olympus came out, here I am, just now finishing the series. The bad news? I’m super bummed to be saying goodbye to such a wealth of fantastic and diverse characters. The good news? While I was dawdling about with Greek and Roman demigods, Riordan went and wrote approximately 582 new books, so there’s plenty more epic characters to get to know and fall in love with. And, one of those series just happens to be titled The Trials of Apollo, which gives me the feeling my beloved characters from Percy and Heroes might just make an appearance to help out the hapless god. After all, the end is usually just a new beginning when demigods and legends are involved. Why she’s lovin’ it: There are some television shows that have a way of tugging on my heartstrings in the most precise manner that given any angsty or feel-good scene, I will cry. It’s a sure thing. It’s almost formulaic. Almost. Though in Parenthood, the acting is really purposeful and sincere, so my tears never feel like they’re a result of manipulation. The emotions the show makes me feel are well-deserved. “Daughters hate their mothers. I think it’s a law of nature. But you know what? Then, they come back.” I’ve always related more to the mother-daughter relationship on Parenthood than what’s depicted on any other show. Just like Sarah Braverman and Amber Holt (played by Lauren Graham and Mae Whitman, respectively), my mom and I were not always happy and in-sync. The close relationship that we have now is a result of work and effort, like any relationship. Those factors give you time to figure each other out, really understand and empathize with one another, and hopefully — like my mom and I or Sarah and Amber — you both become stronger and more content with who you both are independently and dependently. Also, I liked that Sarah and Amber didn’t always need to be around each other for their mutual love to be evident. All of the relationships on Parenthood are relatable for this reason: the audience is able to see the characters grow and develop genuinely, together and apart. That’s a realistic thing to me. In familial relationships, in friendships, in romantic relationships, in any relationship, you are important as an individual just as you are with someone. That individuality is a vital part of how you choose to live and what you choose to live for, and the characters in Parenthood depict that. They are interesting on their own and just as interesting together, but it's that togetherness that tethers them to some sort of common ground, a common ground that reinforces the “Braverman” name. And they love that, the fact that they have a legacy. What’s more is that, they love each other despite obvious flaws, and their trust in each other is always stronger than their doubt. That’s a familial structure I can relate to. Why she’s lovin’ it: Not to be melodramatic, but this album is genius. All the pressure put on young Ella to produce a comparably successful sophomore album, has resulted in a gem, just like coal into a diamond. Melodrama is soulful, but with dance beats, which is such a difficult balance to achieve. Wise beyond her years, Lorde’s music maintains that youthful quality that is fun, but also fervidly melancholic, much like how life is in your late teens. It’s got the painful vicissitude of heartbreak stemming from her first big break-up, and the playfulness of someone who ran a secret Instagram account that reviewed onion rings. Her lyrics and sounds are both sagely deep and young at heart that listeners of any age can connect with it. I certainly did. “Writer in the Dark” gave me chills, goosebumps — all the feels. It perfectly exemplifies what it means to express your feelings through art and how therapeutic that can be. “But in our darkest hours, I’ve stumbled on a secret power.” Her dulcet vocals are resonant and moving. Similarly, on “Hard Feelings/Loveless,” she expresses the transition in a break-up from initial hurt to anger all within one track: “These are what they call hard feelings of love, when the sweet words and fevers all leave us right here in the cold,” she croons, sadly. At the end, she shifts and sings with vicious sweetness, “‘Cause I’m gonna mess your life up. Gonna want to tape my mouth shut. Look out, lovers.” She takes us on all these little emotional sojourns, much like a good collection of short stories does. Cushioning all these powerful and strongly felt lyrics are upbeat pop harmonies. “Green Light,” “Homemade Dynamite,” and “Perfect Places” are inevitable summer party anthems. “Every night, I live and die, feel the party to my bones.” It’s all very footloose and fancy free, which is just the kind of escapism we can all use. “Supercut” is bittersweet — catchy, but with a sentimental theme about remembering all the good times after something has ended. With this one album you can crank it up for a carefree dance party (solo or not) or put your headphones on, stare up into the night sky, and contemplate life. Melodrama is so versatile and accessible and relatable. Lorde is such a tremendous talent, and her very soul can be heard on these tracks. Why she’s lovin' it: The Hate U Give follows sixteen-year-old Starr Carter and her life as a young black woman in a world where police brutality runs rampant and micro and macro aggressions consume every interaction she has with others — a.k.a., the modern day United States. In the beginning of the book, Starr witnesses a white police officer shoot her unarmed childhood best friend, Khalil. The only witness to the murder, Starr’s life becomes full of fear, grief, and uncertainty as she decides whether or not to testify against the officer. The novel also explores interracial relationships (platonic and romantic), gang violence, and domestic abuse. Many young adult books shy away from such dense topics, but Thomas tackles them head-on in an authentic and conversational manner that allows readers to understand in a way they may not have before. Although I’ve been very active in diverse and activist spaces, it’s difficult to ask persecuted people to describe their experiences in a way that doesn’t force them to extend unwanted emotional labor. Seeing the world through the eyes of a fictitious character experiencing very real things allowed me to understand (the best I can as a white woman) how racism seeps into everyday actions and how our social norms actively continue oppression for certain groups of people. My favorite thing about the book is its accessibility. I think it’s so important for literature (and art in general) to be accessible, and Thomas using Starr as a vessel to teach us about these very real issues is the perfect way to help a skeptic realize that yes, racism is still prevalent in our society, and yes, we need to do something about it immediately. She describes institutionalized racism and police brutality, two topics that can often feel academic and difficult to grasp, in a narrative way that sets off the lightbulbs inside the readers' heads. The Hate U Give is the most powerful YA book that I have ever read. Its relevancy makes it a work of literature everyone should read and discuss. This is Thomas' debut novel, and I am already excited to see what she publishes next. Why he’s lovin’ it: Within the last couple of years, I've become more invested into the realm of podcasts. Without a doubt, podcasts have become one of the best places not only for genuine entertainment, but to learn, especially if you love film/TV history. Over the next three Summer Lovin' posts, I'll be giving certain love to some excellent film and TV podcasts that fully deserve your listening attention. The first one we'll be covering is the utterly fantastic 80s All Over. I was born in 1993, thereby not making me a child of the 80s. However, as my childhood progressed, I was introduced to a bevy of family films from that era (Neverending Story, Raiders of the Lost Ark, Return to Oz, and Empire Strikes Back are a few that come to mind) that progressed as I grew older. Today, I'd consider the 80s one of the finest eras in cinema history. 80s All Over is not only a beautiful love letter to this era, but a wonderfully detailed crash course on the decade as well. Every two weeks, film critics Drew McWeeny and Scott Weinberg break down the 80s year by year, month by month (as of this writing, the podcast is currently up to August 1981). But the podcast isn't some sort of droll history lesson, with both Feinberg and McWeeny's passion and excitement — as well as their chemistry — extremely evident. Hearing them debate, ridicule, and adore certain movies is an absolute joy to experience. Not only do the two provide some great anecdotes on experiencing certain films in the theater, but they also supply great history lessons on other aspects of film during the 80s. For example, they discuss how movie posters and movie magazines could really help sell the film in a time where smartphones and the Internet were nonexistent). The pair also offers some recommendations on long-forgotten gems. This latter part is perhaps the best aspect of 80s All Over — offering up alternative and hidden treasures that are intriguing just based off of the hosts' enthusiasm alone (Battle Beyond the Stars, Seems Like Old Times, Used Cars, My Bodyguard, and Prince of the City are just a few recommendations the two give). While we may be aware of films like Raiders of the Lost Ark, The Empire Strikes Back, and The Breakfast Club, Weinberg and McWeeny's evident joy and love for these underrated gems truly elevate them into the public eye. 80s All Over is easily one of the best film podcasts out there to date. Whether you're someone who grew up in the 80s or are just discovering the era now, this is one podcast that definitely deserves a listen. The podcast can be listened to on iTunes as well as through Drew McWeeny's Pulp and Popcorn website. In addition, the two have set up a Patreon page, which you can view here. What are YOU lovin' this week? Sound off in the comments below!